Thursday is GURPSDay and I’m back in the USA and thanks to a sick 3yo I’m up nice and early to get this first script pull going. Her Benadryl will kick in Real Soon Now and she’ll sleep like the Undead (some moaning, some brain-eating, occasionally hitting an adventurer real hard in the face, the usual) until about 9am. So groggy but ahead of schedule where it comes to scripting. My sleep loss and jet-lag is your gain! We’re currently drawing content from 91 blogs. We picked up a new one: Dungeons on Automatic, perhaps the first of these to specifically deal with the Dungeon Fantasy RPG, focusing on automating some of the more drudgery-related tasks related to creating adventuring material, like the random tables of yore.. As always, new blogs are listed first. Only 9 more to go until we’re pulling from 100! But we’ll need your help. 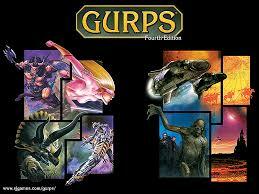 And if you just started a GURPS blog – and I know that some of you have – email me and get on the list! GM Commentary for Session 6.06 (Or “Well, that was crap.”) (10/21/17) – Discussion of the sixth session of my GURPS: Monster Hunters game from a GM perspective. This is generally me reflecting on my few successes and the many, many failures from this mess of a game. “Hell to Pay,” a GURPS/Fantasy Grounds Actual Play (10/22/17) – Posting an Actual Play video of my first-ever GURPS game GMing online with Fantasy Grounds. It was a total blast, I laughed a lot, and I look forward to more in the future. Have you any GURPS over Fantasy Grounds stories to share? Next Next post: Last weekend for Lost Hall of Tyr: please pitch in!